91 South Indian Sweet Recipes : South Indian Desserts, Tarladalal.com. We have a large collection of 90 different types of South Indian Sweets. 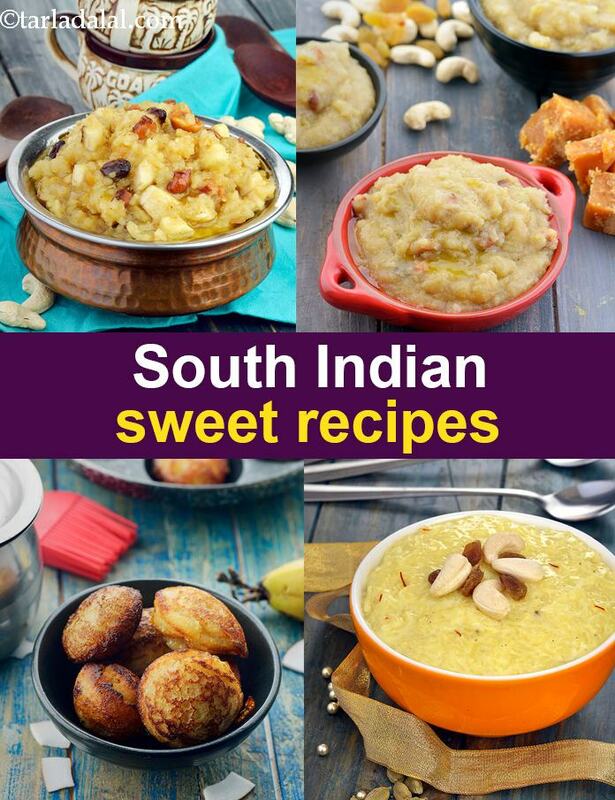 Yes, it's clearly evident that South Indian Dessers and the different types of South Indan Sweet recipes are super popular not only in South India but all across our lovely country. Sweets, which are considered as desserts in most cultures, are served at the beginning of a South Indian meal! Be it Chakra Pongal or Almond Paysaam, Mysore Pak or Rava Laddoo, South Indian cuisine has a wide range of unique sweets, which can broadly be classified as those made with jaggery and those made with sugar. Every household has its favourites, and its unique style of preparing these sweets. Apart from being made to celebrate special occasions and to serve at weddings, many households also have the practice of regularly making sweets and kheers (payasam) to offer to God on Fridays and other auspicious days. No doubt, this section has a lot of exciting treats in store for your sweet tooth. South Indian festival menus are just not complete without Moong Dal Payasam. Considered as one of the most auspicious offerings to God, it is made during most pujas, and is served as the first item on the plantain leaf during a traditional meal. Paal Payasam is a must-serve item during south Indian festivals, weddings and other auspicious occasions. Made of rice cooked in full-fat milk and sweetened with sugar, this kheer has a very rich flavour and creamy texture, which are boosted further by spices like cardamom and saffron. This South Indian Rice Kheer is something that kids and adults look forward to enjoying on special occasions. Sweet Pongal is compulsorily made for the Pongal festival. Freshly-harvested rice, if available, is used to make the Sweet Pongal, in new earthen pots! The Sweet Banana Pongal features a jaggery-flavoured mixture of cooked rice and lentils, served with a garnish of chopped bananas. The Ela Ada is a very famous sweet rice pancake dish in Kerala, and is made by Keralites wherever in the world they are. Serve it as an evening snack. Looking for a sweet appam with banana and molten jaggery, then try Unni Appam. Don't forget to try the Sweet Idli which has a mixture of moong dal, coocnut and jaggery. South Indian Sweet for son in law! Maapillai Payasam” (meaning son-in-law kheer)! With its milky flavour and rich garnishes, the Vermicelli Kheer was considered a perfect dish to serve to a visiting son-in-law, who used to traditionally be treated like a King! Enjoy our South Indian Sweet Recipes and South Indian Recipes article below. Delicate honeycombs of cashewnuts, a true delicacy that simply melts in the mouth. Making this requires your full attention. This delicious fudge from South India has a granular texture. Do not be alarmed by the amount of ghee mentioned in the recipe as most of it is drained out at the end of the cooking process. A traditional coconut meat sweet. A simpler version of this traditional sweet. Perhaps the healthiest of payasam recipes, this is an interesting way to give your family a vitamin a rich health boost! Fresh coconut ladoo, easy to make for festive occasions. Khus khus payasam, it is a tasty dessert treat to a stressed out person!